What, August is Nearly Over? I have several new developments to report this week. The third Dabir and Asim novel is coming along nicely, although I’m still tinkering with book 2, and the short story collection will be heading off to the copyeditor this week. I sat down for an interview with Ryan Costello Jr. of 3.5 Private Sanctuaryat GenCon, and he asked me some great questions about my Pathfinder Tales novel, Plague of Shadows. You can find that interview, along with a look ahead at the Pathfinder Tales line from the indispensable Pierce Waters of Paizo, by clicking here. 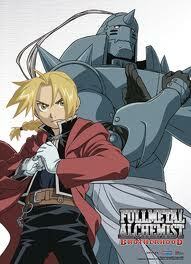 Lastly, I have been power watching an anime that exceeded my expectations. I discussed it in more detail at Black Gate, but here’s the start. The rest of this article can be found at the Black Gate web site. I got to sit down and talk with Sohaib Awan of Fictional Frontiers about The Desert of Souls, Black Gate, sword-and-sorcery, and Harold Lamb. Sohaib asked some questions that really got me thinking (and I wish I’d segued my discussion of 80s adventure movies into my discussion of earlier adventure movies, but ah well). I’ve begun listening into Sohaib’s show in the weeks since, and I’m pretty sure other speculative fiction fans will find the show not only entertaining, but insightful. My interview is here; the site for Fictional Frontiers itself is here. I’m a fan of books aimed at writers, and I’m always delighted to find another good one. 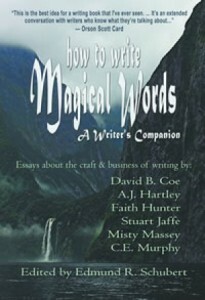 How to Write Magical Words: A Writer’s Companion debuted in January 2011. Unlike most “how to write” books that I’ve ever seen, Magical Words is presented in bite-size chunks. The authors take turns writing about various topics, presenting short essays with information, advice, and helpful anecdotes, then get out of the way for the next essay. None of which are more than four or five pages long. It’s an ideal approach for someone working in this busy modern world, or for someone under deadline, or with kids, or who wants to read a little something before sitting down to write for the day, and editor Edmund Schubert is to be commended for the structure. The book is broadly divided into seven categories, like “Characters, Dialogue, & Point of View” or “Self-Editing,” into which each of the short essays is placed. Perhaps because the material originated on the web site magicalwords.net there’s an approachable, conversational quality to the advice — indeed, the contributing writers often react and expand upon the advice in the concluding remarks to each essay. As I read my way through the book I found myself looking more and more forward to seeing what the other writers would add, and what alternative perspective they might be able to offer. It was a lot like listening to a group of helpful professional writers as they trade tips among themselves — one has the sense that they are not so much talking at you as talking in a group in which you yourself would be welcome to drop in and ask for a few tips. The rest of this essay can be found at the Black Gate web site. I know I’ve mentioned it on my Fiction page, but with all the talk of Dabir and Asim and The Desert of Souls I haven’t been talking much about the other novel I released this year, Plague of Shadows, a sword-and-sorcery adventure set in Paizo’s Pathfinder Tales line. It’s available through Amazon, Barnes and Noble, and retailers nationwide. A month or so ago Flames Rising published my behind-the-scenes look at the creation of the book, and you can find it here. Friday and Saturday (August 5 and 6) I’ll be signing copies of Plague of Shadows at the Paizo booth in Indianpolis at GenCon, during the best four days of gaming. I hope I will be seeing some of you there! When I return, I plan to post a long overdue write-up of a great new book for writers, How to Write Magical Words, edited by Edmund R. Schubert.